These presentations share the wisdom and practices of Sanatana Dharma and empower us to apply this wisdom in our every day lives. In doing so, we find a path by which we can achieve our goals and manifest our Ideal of Perfection. The presentations include the Das Mahavidyas, Jyotirlingams, and Cosmic Puja, as well as teachings on Family Wealth and more. Family Wealth shows us how to calculate the wealth of a family, how to prioritize the allocations of that wealth, and how to insure the equitable distribution for subsequent generations to understand the true value of Wealth. This is an especially valuable tool in the worship of Mother Lakshmi. This is a list of the ten tribes of sannyasins (Hindu renunciates) created by Shri Adi Shankaracharya. 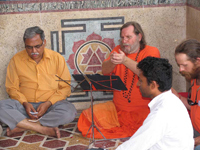 Each tribe’s name is given in both Sanskrit and English. Click on the arrows to scroll through the presentation. This presentation lists the asuras in the Army of the Great Ego, as described in the Chandi Path. Each asura represents a specific quality that keeps us from realizing the Divinity within. Click on the arrows to scroll through the presentation. The panchang is the Hindu calendar, which notes the lunar month, lunar fortnight (moon waxing or waning), all given in Sanskrit. Pujaris use this information in their daily worship. This tutorial teaches us how to read a panchang. Click on the arrows to scroll through the presentation. The Devi Gita outlines the ten ideal qualities of every spiritual aspirant. Somanatham, Mallikarjunam, Mahakalam, Omkareswaram, Kedaranatham, Bhimasankaram, Visveswaram, Tryambakam, Baijanatham, Nageswaram, Ramesvaram and Ghusmesvaram. The Sadhana Panchakam is a Sanskrit stotram containing five verses in praise of spiritual discipline (sadhana), authored by Sri Shankaracharya. The Panchakam is located at the beginning of the Advanced Shiva Puja book.